Voxland Electric, Inc. provides expert residential and commercial electrical design and installation in the Fargo-Moorhead area. For custom homes, new construction and remodeling, contractors, homeowners and businesses alike, trust us for their electrical needs. 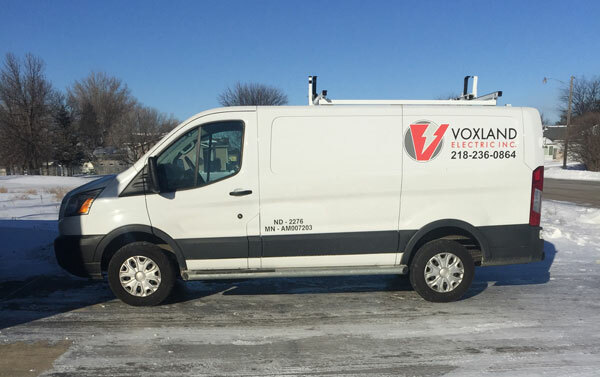 At Voxland, we’re on a mission to provide the highest quality residential and commercial electrical services to the Fargo-Moorhead area, while delivering incomparable customer service. Every member of our staff is dedicated to meeting and exceeding the expectations of our clients, adding them to a long list of satisfied customers with every job we complete. Because we are locally owned and operated, we are able to concentrate on personal service, without the bureaucracy found in larger, top-heavy companies. From the receptionist in the front office to the electricians working on your project, we don’t just want to meet your expectations, we aim to exceed them. We proudly guarantee all of our work and we are licensed, bonded and insured. At Voxland Electric, we are committed to providing superior electrical design and installation in even the most challenging residential applications. Home owners as well as luxury homebuilders and remodelers in the Fargo-Moorhead area call on Voxland for consistent, hassle-free design and installation of electrical and lighting systems. Fargo-Moorhead area business owners trust and recommend us to their business associates. We are qualified, efficient, safe and affordable, and we have the manpower needed to get large jobs done with little to no interruption in your day-to-day operations. We provide commercial new construction and remodeling services for clients. Time is valuable; our system makes it easy for you to pay your invoice by offering a secure online payment option.